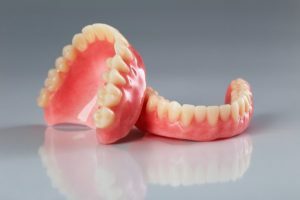 Diane Tozer, a Dental Prosthetist at Westside Denture Centre in Queensland, is often asked how to care for dentures to ensure they last the optimum 5 – 8 years while retaining their looks, comfort and performance. She has compiled the following short guide that will explain how to care for your dentures, whatever type you wear. Diane explains that for anyone with whose dentures are not as comfortable as they would like, or who is feeling that it’s time to update their smile with the more natural looking dentures now available, please call her at Westside Denture on 07 3278 0580 and arrange an initial consultation today. Having a comfortable well-fitting denture is vital, as it is very important to prevent further bone loss from the jaw by wearing them for as long as possible each day. Whenever you take your dentures out, leave them in a safe place where pets cannot find them as Diane has had a few calls from patients who tell her that ‘the dog has eaten my teeth’! Although dentures are strong and can help you chew your food, they are quite easy to damage if dropped. When cleaning them, do so over a bowl or basin containing water, or over a folded towel, in order to cushion them in case of an accidental slip. An important point to remember for all denture wearers is that even if there are no natural teeth remaining, brushing the gums and tongue with a soft-bristled brush, morning and evening will keep the mouth healthy and remove plaque. For partial denture wearers, it is even more important to look after remaining teeth to ensure dentures continue to fit well. These are the most commonly worn and least expensive. Rinse them after each meal to ensure no food particles have lodged between teeth or under your plate. Regular soaking in cool water containing a cleaning solution will improve hygiene and keep your dentures feeling fresh. When cleaning, use a paste and brush designed not to scratch or roughen the acrylic material. Always rinse thoroughly after soaking or cleaning and never allow your denture to dry out. When they are not in your mouth, keep them in water to ensure comfort and fit. Chrome Cobalt are lightweight metal dentures that are hypoallergenic, do not cover the whole, roof-of-the-mouth and which many wearers prefer for their lightness and comfort. They are easy to clean and can either be soaked in a dental cleansing solution for twenty minutes or so before rinsing and replacing or, can be soaked in a weaker solution overnight. The only thing to remember is that some dental cleansers can cause corrosion of metal parts so ask your Dentist or Prosthetist if you are unsure. Valplast is a material often used for partial dentures for its comfort and strength. As with acrylic dentures, you should always rinse Valplast after eating. However, these dentures are not suitable for regular brushing as this can damage the Valplast material and wearers should remove partial dentures before cleaning their remaining, natural teeth. Soak dentures for around 15 minutes in Valplast cleaner. Many Dentists and Prosthetists recommend using a sonic cleaner bath to ensure a thorough clean. However, a very soft brush may be used occasionally, if necessary, to remove food particles. Dentists often advise removal of dentures overnight. Soaking a Valplast denture in hot water for just a few minutes before replacing in the mouth will soften the material making it flexible and fit comfortably once more. Follow the tips for the type of denture you wear and keep your dentures looking and feeling great!